1. What is the Partnership Program? The PP is an annual membership. Upon the end of each membership year, we will reevaluate your needs and customize them to fit what is most effective for your ministry. 3. I can't afford a lump sum payment. Do you offer a payment plan? Yes! We established the PP to be a blessing to your ministry and we certainly understand budgetary constraints! Let's talk about how what level would work best for your group and what a payment plan for that level would look like. 4. Do I receive all of my resources at once? Depending on the level that you choose, you will receive all of your brochures and your copies of Empty Arms and I'll Hold You in Heaven upon receipt of your signed PP agreement. Your plates and Certificates of Life will be sent as ordered throughout the year. 5. 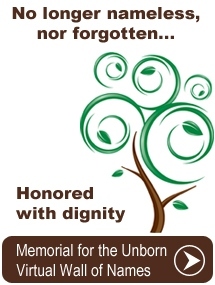 I'm not local, how would having a memorial service with the NMU benefit my post abortion recovery group? Great question! 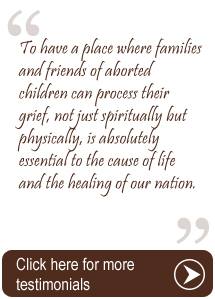 It has been our experience that even though many post abortion recovery programs include some type of final ceremony it can take weeks for the client to fully absorb all of the grace and healing that they have been presented with during their retreat or concentrated study. 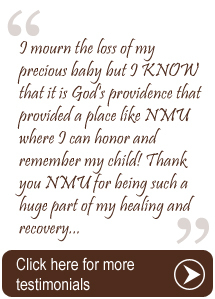 Our memorial services provide that final step of closure by providing a customized program that provides dignity for each specific child represented. 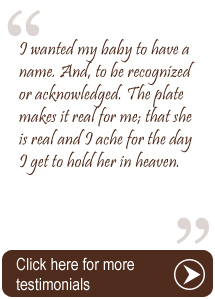 From the presentation of the Certificate of Life to the plate placement, our clients are gently led through the stages of closure to a beautiful release of their child to the Lord. Some groups prefer to plan a trip to Chattanooga to be physically present for this profound moment. Others may not be able to coordinate such a trip, but can still participate via a coordinated service by Skype to see their actual plate being placed on the Wall of Names!